When I think of casual elegance, I think of The Metro Wine Bar & Bistro. Tucked away on Western Avenue with a little canopied entrance around the south side of the building, it feels like a discovery each time you enter. The interior is clean and cozy. It feels lived in, but not worn. The restaurant is well cared for, which is a sign of things to come for guests, who will find that same care applies to them. It’s also the kind of place where you feel comfortable being a little dressed up. Or a lot dressed up. And maybe that doesn’t immediately appeal to all of you, but here’s a secret I’ve learned: dressing up feels rrrrrrrreally good, especially if your dress clothes fit you well (they should). Dressing up is a subtle cue to your brain that it’s going to be a good night. You look good. You should be proud. Walk tall and all that. And there are some places where you just don’t feel right going in all dressed up, so it’s nice to find a spot where you can look good and not feel out of place. That’s The Metro. It’s not black-tie or anything like that, but a nice sports coat and a pair of slacks won’t make you stand out in any ways you don’t want to stand out. The menu at The Metro is a study in restraint. A few appetizers, salads and soups. A few pasta dishes. A page of entrees and then a small seasonal menu. 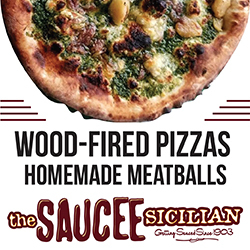 I can’t speak to the early days of this restaurant, but I can tell you it feels like they’ve learned to hone their menu to a razor’s edge over years of practice. Some upscale spots have trouble with menu bloat. Old favorites that have long since outlasted their appeal can bulk up a menu until finding the really good stuff becomes a chore. The Metro’s list by contrast seems focused on what they do best without a lot of sentimentality. Check out the wine list, for example. How easy would it be to drop a tome du vin on the table and walk away, leaving diners to turn page after page of bottles before finally settling on a glass of chablis? 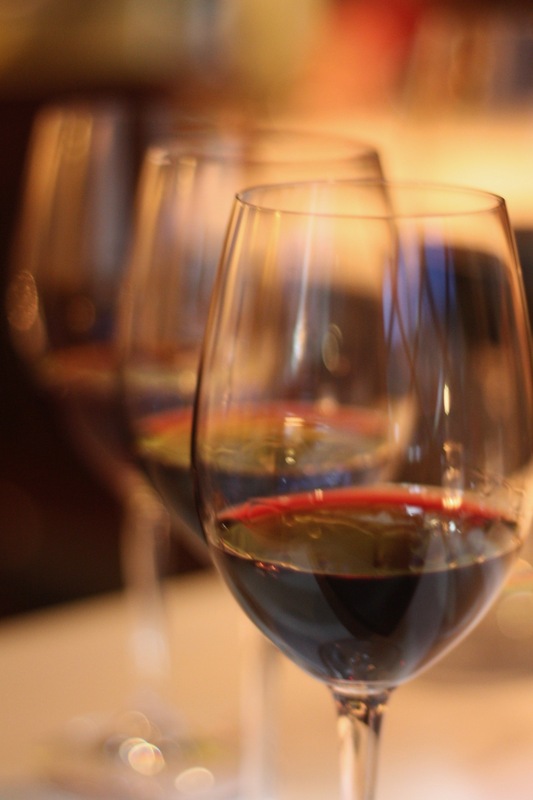 Instead, it’s a tightly curated one-sheet, which makes it infinitely easier to choose, say, the In Your Face Reds wine flight — a trio of bold wines to accompany your meal. My friend Julie and I started with stracchetti ($15) and we were a little surprised when it arrived. The menu promises coffee-rubbed beef tenderloin, sliced thin and seared with accompaniments. 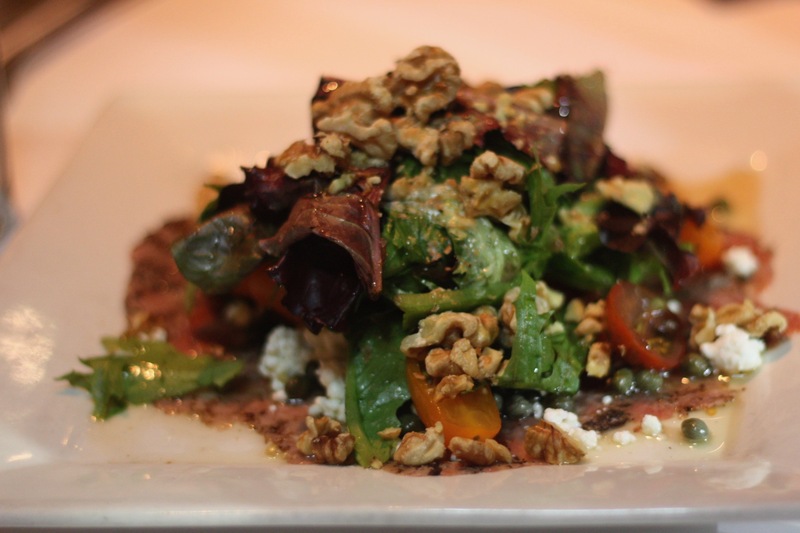 What we got was a base of beef stacked high with honey-truffle vinaigrette-dressed salad, heirloom tomatoes, creamy goat cheese, capers and walnuts. Now, let’s be clear: we cleaned that plate. It was a lovely salad with a dizzying array of competing flavors that eventually found a harmonious balance. But the beef was a bit lost in the mix, which seems a shame, as it was the primary selling point. I was much more satisfied with the bowl of vichyssoise ($6) that arrived next. Chilled potato soup, smooth and creamy, with chopped chives and dusting of freshly cracked pepper. 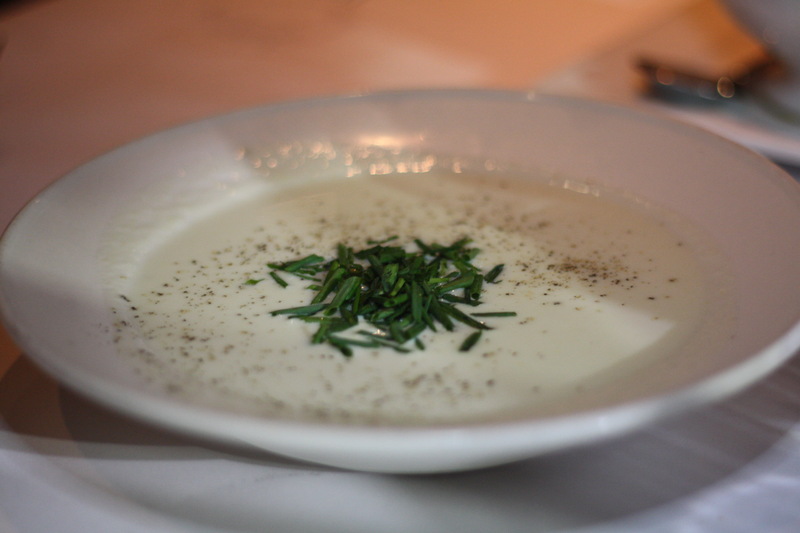 Maybe that sounds weird for fall, but it could be the dead of winter and I’m still going to order vichyssoise. The trick here is the potato lends its subtle, starchy flavor to the soup without any of the texture. Puree potatoes at home and you’ll likely end up with a thick, glue-y paste. But this is the distillation of potato flavor in the pure, creamy glory. Jules got the French onion soup ($6), which I would have ordered if she hadn’t gotten to it first. It’s got some lovely soft onions in a medium-dark broth under an impenetrable canopy of melted gruyere. Careful eating this soup. Seriously. Gruyere has an intensely nutty flavor when melted, but it’s also chewy as all get out. Make sure you don’t try to swallow it until you’ve really macerated it or else you might choke. I’m speaking from embarrassing experience here. As entrees go, I think the filet of flounder ($22) is a homerun that leaves one baseball field and lands in another baseball field, so you actually get a run and a triple. 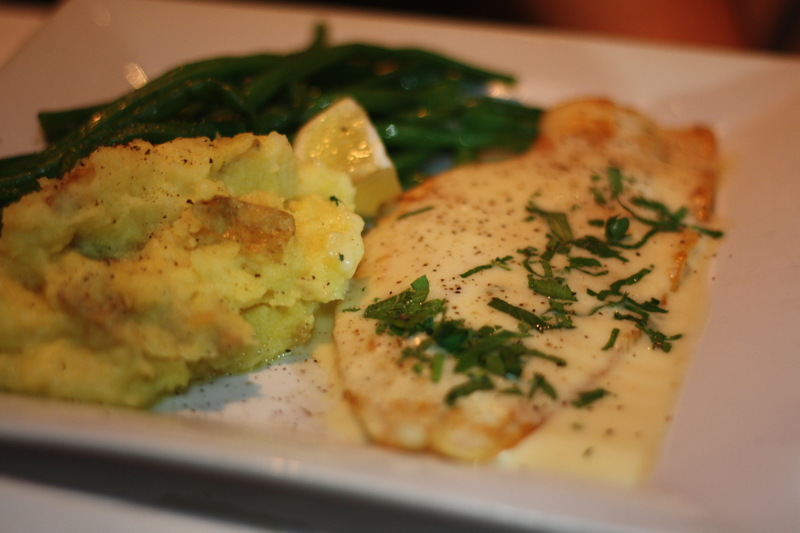 The fish is ultra tender and flaky with a citrus butter cream sauce that reminded me favorably of lemon curd. On the side are some of the best chunky mashed potatoes I’ve had in a long while. Goodness gracious, they were thick and buttery and full of real potato flavor and just a delight. The sauteed green beans on the side were solidly done a nice deep green flavor. A spritz of lemon juice on top really gave them extra life. 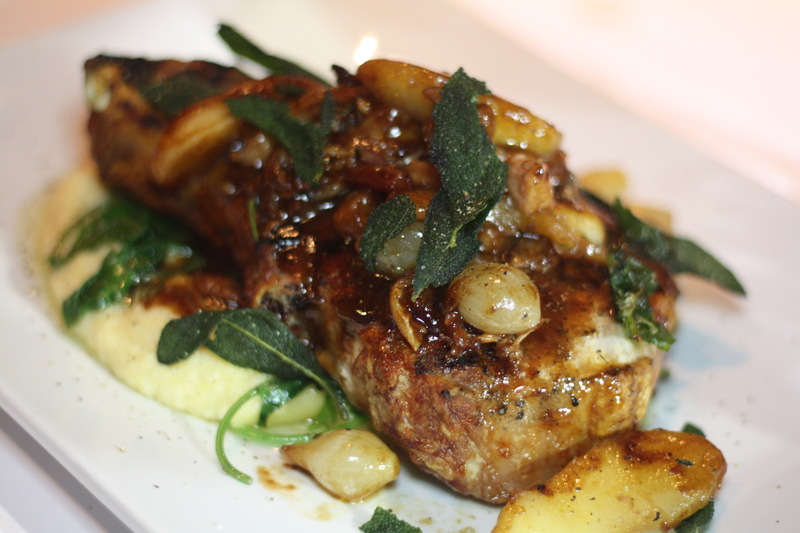 On the fall seasonal menu (available for the next couple of months), I chose the pork chop served with creamy cheddar polenta ($32). Oh me oh my, this pork chop. Bone-in, in case you want to eat it like a caveman, and cooked to a deep bronze with a crisp crust that gives way to tender, juicy meat. On top you get fried sage, tender roasted apples, tomatoes and pork belly confit — aka the fattiest cut of pork poached in more fat until it shreds into supple, tender bites. I promised myself I wouldn’t cry, but these are tears of joy. Accept the offer of freshly cracked pepper for a nice pop of spice and be sure to check under the chop for sauteed kale. 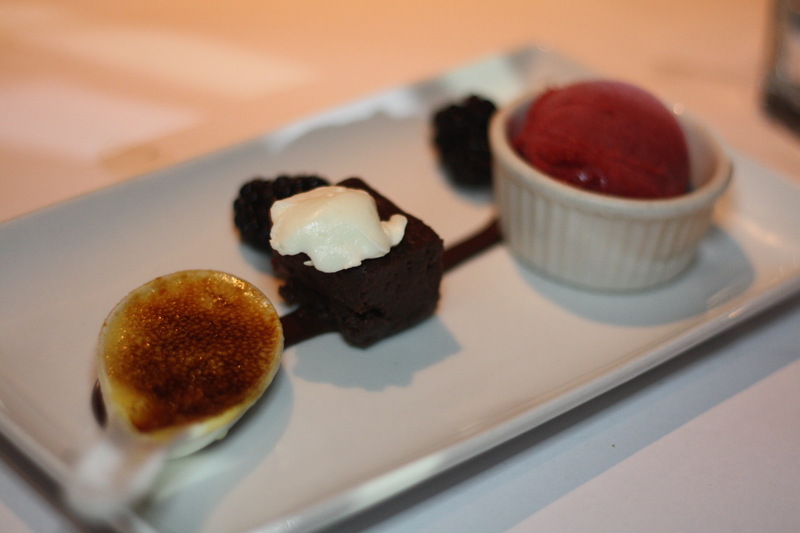 For dessert, we tried the dessert trio ($8) which features a scoop of raspberry sorbet — smooth, tart and wonderful — a small square of chocolate fudge cake that was so rich is blows its nose with stock certificates and a spoonful of creme brulee. Folks, this here’s good eats. That said, I’d be remiss if I didn’t mention the taste we got of the constantly rotating house-made ice creams at The Metro. We sampled a scoop of butterscotch ice cream that was so decadent it felt like a sin. And the chef had a little fun, too, slipping in what tasted and felt like a touch of chili powder for a rising tickle of heat on the back end. While the food was outstanding, I must point to the secret strength of The Metro: the servers. If you enjoy personable and personal service with people who are skilled at making guests feel at home, this is the place for you. A great meal must have great food, but you cannot underestimate the appeal of excellent service. The Metro just so happens to serve both up in equal measure.